The decisive defeat of Venice's mercenary army by forces of the League of Cambrai at the Battle of Agnadello tested Venice's political and military viability in a variety of ways. Venice's mainland possessions began falling like dominos to the forces of Maximilian, Emperor of the Holy Roman Empire. Venetian forces were left standing only at the shoreline of their protective lagoon. 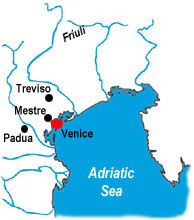 Only Mestre, Treviso and the Friuli remained under her fragile control. At this nadir, however, Venice began to regroup. First came a refreshing military rebound: A nocturnal surprise attack recaptured Padua after less than two months under enemy control. Next came a breakthrough on the diplomatic front: Venice negotiated a separate peace with the Papal forces of Julius II. The peace came at the price of enormous and humiliating concessions to the Pope, but Venice reconciled herself to them by resolving not to honor the terms of settlement anyway. At the end of 1509, however, the other members of the League of Cambrai were as hostile and threatening as ever. There followed then five years of war, shifting alliances and treachery so complex and bizarre as to defy both credibility and succinct explanation. For the most part, the major players remained the same throughout: Venice, the Papal States, France, Spain and the Holy Roman Empire. England played a cameo role at certain stages; the Swiss appeared as well, not as a nation-state but through large independent mercenary armies. The permutations seemed endless: At first Venice stood against all the others; then Venice and the Papal States, in a loose alliance with England and Spain, joined together against France; at one point the Papal States and the Holy Roman Empire were at odds with Venice. Later, France and Venice stood against the Papal States and Spain. Major pitched battles followed in seemingly endless succession: Ravenna, Novara, Schio, Marignano. The year 1516 brought an end to it all at last. What was the result of so much energy, pillage and death? Remarkably, Venice found herself at the end with almost exactly the same territorial reach that she had enjoyed at the beginning. The difference, however--obvious now both to Venice and to the other power players of her world--was that Venice was no longer able to chart a major independent course on the world stage. The Republic had received a clear and indisputable intimation of her own mortality.